Formula One rolls into Malaysia this week for the second round of the championship at the Sepang International Circuit, where talk surrounding the utter dominance of Mercedes will for once take a back seat to the belated arrival of Fernando Alonso. The season-opening Australian Grand Prix bordered on the farcical as defending world champion Lewis Hamilton led a Mercedes one-two ahead of Nico Rosberg in a race where only 13 of a possible 20 cars were racing by the end of the first lap. Mechanical failure, under-prepared cars and injury accounted for most of the withdrawals but double world champion Alonso was unable to even make the trip to Melbourne following a pre-season crash at Barcelona last month on his return to McLaren. Sitting out the race in order to minimise the chance of suffering sudden-impact syndrome, Alonso will be keen to get reacquainted with a team where he spent an unhappy season in 2007 but judging by McLaren's performance in Australia, any joy is expected to be short-lived. Struggling for pace and reliability with the new Honda engine, McLaren teammate Jenson Button crawled around Albert Park to cross the line last of the 11 finishers, while Alonso's stand-in Kevin Magnussen failed to start the race due to engine issues. The Spaniard will be hoping the team have been able to make significant improvements since Australia two weeks ago and can at least make the car competitive enough to keep pace with the back-markers, something that was out of reach in Melbourne. 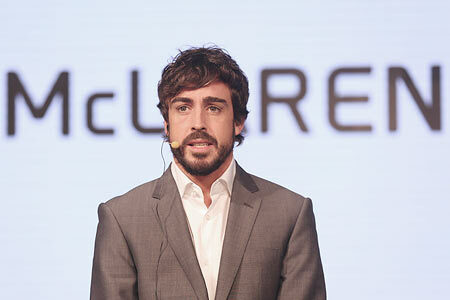 "I watched the weekend in Australia very closely and I was in touch with the team from the moment they arrived," Alonso said of the season-opener. "It's clear we have a lot of work ahead of us but Jenson's result in Melbourne was encouraging from the point of view of reliability and data collection, which are extremely important." Turning to his recovery from the pre-season crash, Alonso will need to pass a fitness test on Thursday before he can race but is looking forward to marking his return at a circuit he has enjoyed a fair amount of success, including three victories. "I've been working hard on my fitness and I feel good and ready to go this weekend. The weekend will be tough but I'm looking forward to getting into the MP4-30 for the first time in a Grand Prix and getting back to racing." Up at the head of the field, Mercedes are once again expected to surge clear from the chasing pack with Hamilton and Rosberg continuing the battle for supremacy while the other teams scramble around for minor honours. Four-time world champion Sebastian Vettel's distant third place finish on his Ferrari debut was an encouraging start for a team seeking to reestablish itself among the elites but the Italian outfit can expect a tougher challenge from Williams in Malaysia. The Mercedes-powered team lost Valtteri Bottas to injury following qualifying in Australia and the Finn and team mate Felipe Massa can expect a better performance from the Williams around the sweeping corners of the Hermann Tilke-designed track. In a week when the sport suffered another blow with the dropping of the German Grand Prix from this season's calendar for financial reasons, anything other than a Mercedes victory would be a welcome lift for a series in which monotony has replaced drama. The chances of that happening remain slim, however, but Malaysia's volatile weather could intervene as it did in 2012 when Alonso dodged the puddles in a modest Ferrari to win the race after qualifying ninth.